How to get there: Interstate 70 west from Denver, take the Leadville / Copper Mountain exit and continue on Hwy. 91 towards Leadville. The road climbs gently with a river on the left side. Shortly, the road crosses the river and Hwy. 91 continues up a long hill on the left side of the valley. Park before this hill, there is ample space on the left side of the road. There is also a smaller road that forks right near this point, this road is closed by a gate about 100 meter from the fork. The GPS coordinates of this point is, north 39:27.498, west 106:08.626, elevation 3120 meter. (My GPS measured a bit high on this hike, so likely closer to 3110 meter). Route description: Start out along the small forking road, notice the creek that is coming down and leave the road well before you can read all the signs on the gate. Head up the slope on the left (west) side of the small creek. 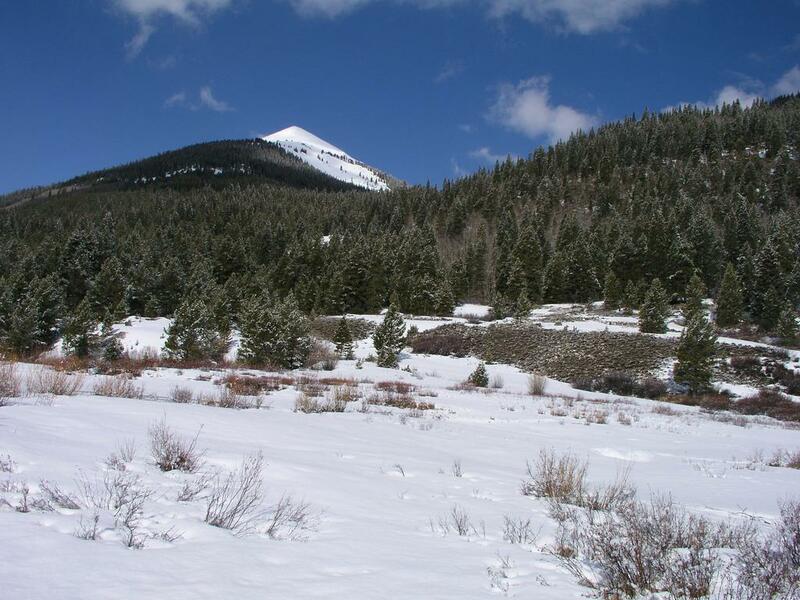 (When I did this hike, one could ski all the way, avoiding patches without snow. However, the snow was rotten and I had frequent falls through, making my track three feet deep in places.) Zig-zag on skis, in summer, just head straight up. After a 300 meter vertical struggle (at least in April), you will see the lower station of the Copper Mountain ski lift called Blackjack. Cross the creek here, this location has elevation 3420 meter and coordinates north 39:27.678, west 106:09.808. From here, the skiing is much easier. Continue in more open terrain passing the lower station of the second ski lift, Mountain Chief. The route continues into and up this very nice mountain valley, gradually climbing in order to hit the very impressive north-east ridge of Jacque Peak. This ridge connects the mountain with the unranked mountain Union Peak, part of the ski area. After gaining the ridge, continue climbing, the ridge gets somewhat steeper and skis can be left when appropriate. (I left mine and continued on foot at elevation 3860 meter, coordinates north 39:27.389, west 106:11.537.) However, this ridge may be skied all the way to the top with care if the snow conditions are favorable. Stay on the main ridge, in winter, beware of cornices, the slope on the right hand side is rather steep. 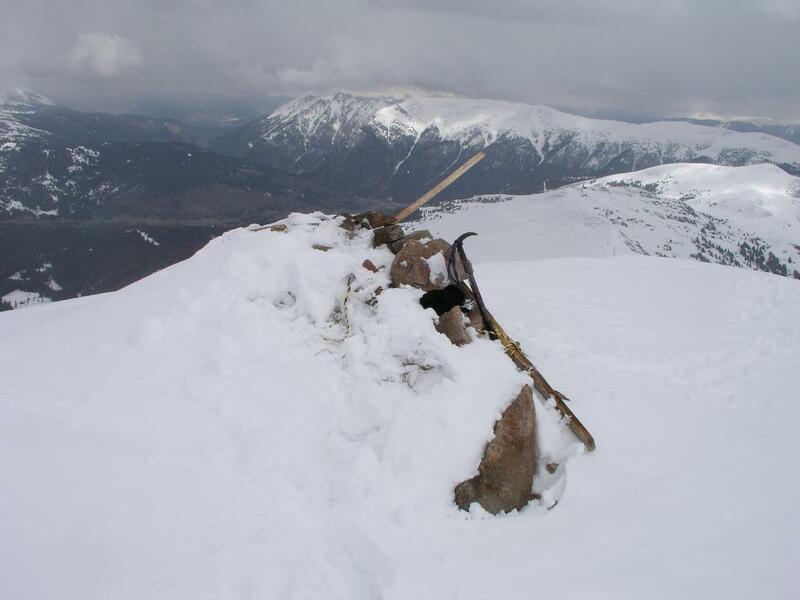 There is a short, slightly steeper section, but the (winter) difficulty of this ridge never exceeds (YDS) class 2+. In summer, this route is class 2. 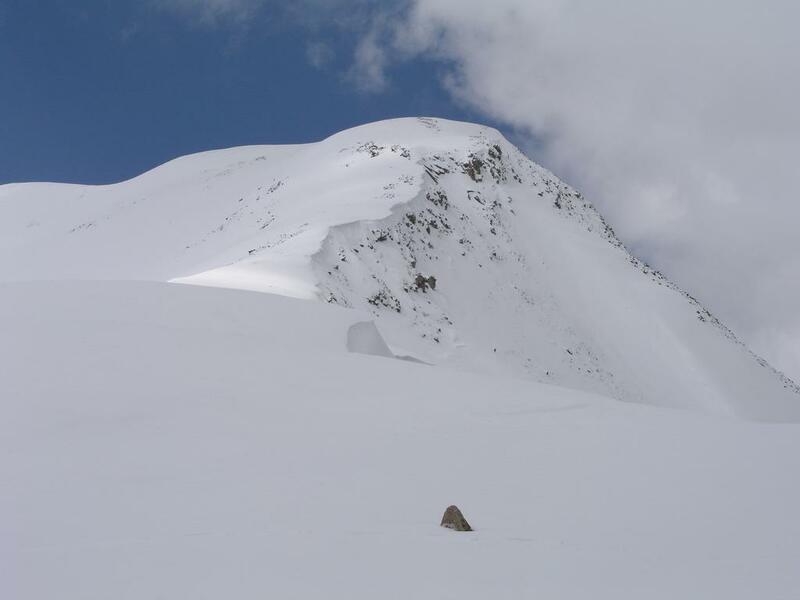 Then the ridge broadens and becomes much more gentle, after one false summit, the top is close and easily reached. 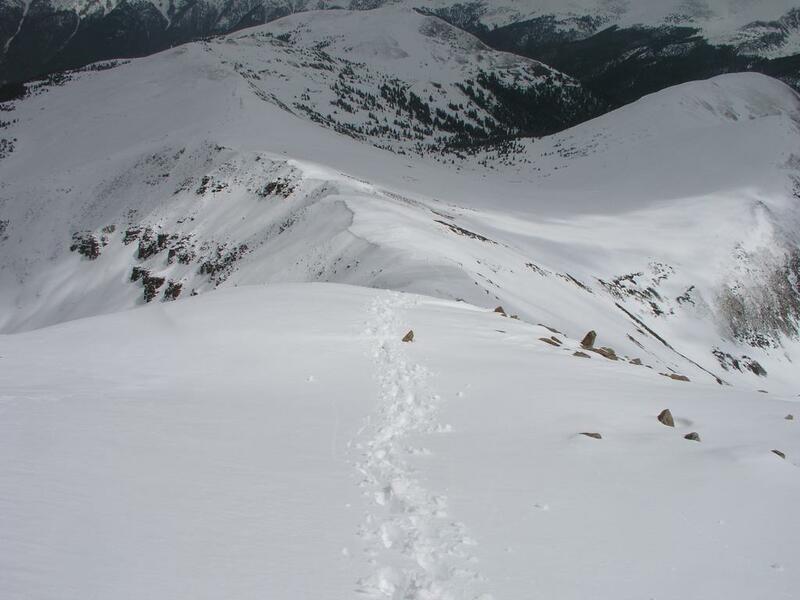 In winter, an attractive return route is to complete the ridge traverse across to Union Peak, then descend the Copper Mountain ski slopes. The disadvantage being that you end up away from your car, unless this is planned in advance. Comments: This peak is number 77 in Colorado when ranked by prominence, however, only number 482 when ranked by height. Prominent mountains most often have excellent views and Jacque Peak is no exception. The day was warm, no wind, but with a fair amount of clouds. 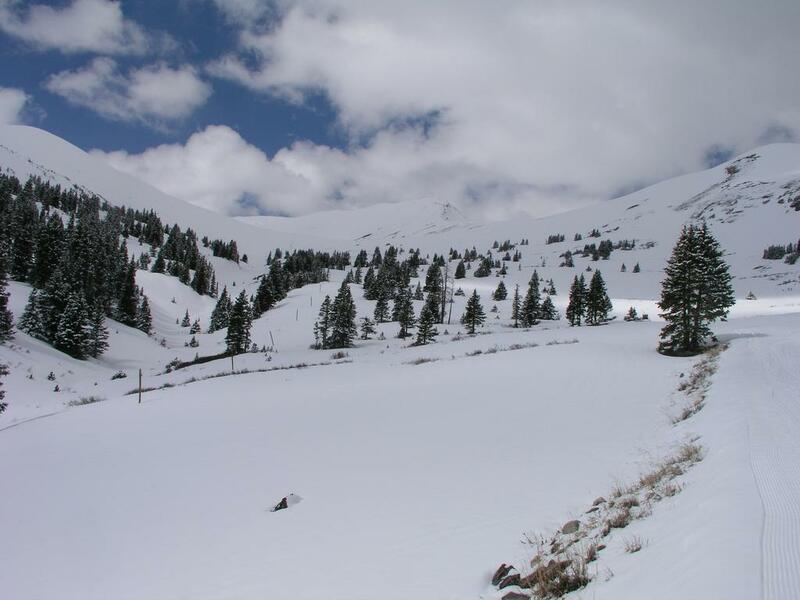 The two ski lifts (Blackjack and Mountain Chief) that serve the upper part of the valley were closed for the season. I did not notice any tracks or other signs of climbers, my guess is that this peak is rather seldom visited, particularly during winter time. Jacque Peak, as seen from the top of Copper Mountain. View from the trailhead, Tucker Mountain (3760m) on the left. The route proceeds up the valley on the right side of Tucker Mountain. View across the valley when climbing among trees, the Ten Mile Range. Jacque Peak, at the end of the valley. The ridge is up to the right. Jacque Peak, the steepest part of the ridge is near the rocks just before the ridge broadens to a summit cone. The Jacque Peak summit cairn. The Ten Mile Range as seen from the summit of Jacque. Descending the ridge, the steepest section is just ahead.